Banking Awareness Quiz 7 – Practice Sets article provides the list of several bank related questions to prepare aspirants of different competitive exams in India, primarily for banking related employment. The article Banking Awareness Quiz 7 – Practice Sets is very useful for different exams such as IBPS PO, Clerk, SSC CGL, SBI PO, NIACL Assistant, NICL AO, IBPS RRB, Railways, Civil Services etc. 2. In which year did second phase of nationalization of banks took place? 4. What is the base year for new series of IIP (Index of Industrial Production) ? 5. Which of the following is not an objective of fiscal policy of Government of India ? 6. Increase in Fiscal Deficit leads to ______. 7.’Growth with Stability’ was the aim of which of the following Five Year Plans ? 8. Which of the following is not a part of India’s Money Market ? 9. When more than one banks are allowing credit facilities to one party in coordination with each other under a formal arrangement, the arrangement is called __. 10. International Bank for Reconstruction and Development is related to _____. 1. A banking system in which a big bank has a number of branches in different parts of the country is known as ___. 2. Which of the following is an example of near money ? 3. Raising or lowering of the central bank discount rate is known as ____. 4.’Gold Tranche’ refers to ___. A. a credit system granted by IMF to its members. C. A credit system granted by WTO to its members. 5. National Food Security Mission was launched in the year ___. 6. Which is a legal tender in a modern economy amongst the following ? 7. Which of the following doesn’t relates with banking or finance ? 9. Which of the following is not a characteristics of Fiat money? 10. A banking system where all operations are confined to a single office is known as _____. 1. Which of the following is not a Financial/Economic term? 2. What is the full form of FIMMDA? 3. An organisation which pools money from investors & invests in stock, bonds, shares is called ______. 4. Which of the following term in related with Economy? 5. Which of amongst the following is not the aim of Debt Management? 7. Negotiated Dealing System Relates to _____. 8. The Base rate of each bank is to be reviewed after every_______. 9. Gross Domestic Product is a measure of_______. 10. In which of the following years, the concept of Micro Finance launched ? 2. If a loan is repaid by a cheque, ____. A. Total bank reserves in the system decreases. B. Total bank reserves are not affected. C. Increase in total bank reserves in the system. 3. Consider the following statements about Gold Standard and state which of them are true ? (B)It also means the exchange rate is determined by demand and supply between the gold points. 4. Which of the following is not a component of bank deposits ? 5. The new issue market is connected with _______. 6. Which of the following is a new instruments permitted by RBI to bank under Tier II for Capital adequacy purposes and what is its minimum maturity period ? D. Redeemable preference shares, 15 years. 7. Which of the following interest rates are not fixed by RBI and left to the discretion of the Bank concerned ? 8. Which of the following liabilities is not taken as part of Time and demand liabilities for the purpose of CRR ? (D) Willingness of the borrowers to take loans from commercial banks. 1. What is meant by a Scheduled Bank ? 2. Which one of the following is not a Quantitative credit control measure of the Reserve Bank of India ? 5. Consider the following statement and state which among those is/are correct ? 6. In deficit financing, the government borrows money from _____. 7. CSO was established in the year ______. 8. On the recommendation of which committee Rail Budget was separated from General Budget in 1924 ? 9. Treasury bills also called as T- bills are the part of ____. 10. Planned expenditure in India is made from _______. 1. Primary Deficit is obtained by subtracting ____ from fiscal deficit. 2. In India nationalization of banks took place in how many phases ? 4. Which of the following come under non-plan expenditure ? (D) Maintenance expenditure for the infrastructure created in previous plans. 5. Which of the following does not come under tertiary sector of the economy ? 6. Which of the following is not a direct tax ? 7. Which of the following schedules of Indian constitution includes Banking ? 9. What is a soft currency ? B. A currency which can be easily used for settling any International transactions. 10. Which of the following is not a Banking/ Economy Term ? 1 .Which one of the following sources is not considered as a source of Government revenue ? 2. As we know that Reserve Bank of India changes the CRR. Which of the following statement is correct in this regard ? (A) Reduction in CRR increases the liquidity position within Indian banks. (B) Decrease in CRR decreases lending capacity of banks. (C) Increase in CRR does not affect the liquidity position. A. Deficit on Trade Account . B. Deficit on Invisible Account. C. Deficit on Trade and Invisible Account. D. Deficit on Trade Invisible and Capital Account. 7. Which one of the following is an example of joint supply ? 8. Consider the following statements regarding loan syndication and state which among those are true? (A) More than one debtors applying for a loan to one creditor. (B) More than one creditors coming together to provide single loan. (C) More than one creditors coming together to provide multiple loans. 10. If RBI adopts an expansionist open market operations policy, this means that it will…………. C. openly announce to the market that it intends to expand credit. 2. If an Indian Citizen renting a flat in London it is to be included in ………. 3. Parallel economy emerges due to …………..
5. Government securities are considered liquid because they are ………. A. Backed by the government treasury . 6. Who formulates the Monetary policy in India ? 7. The Tax on import and export is known as____. 8. The Integrated Action plan recently approved by the Government of India is related with ____. 9. Which of the following sets of sources of revenue belongs to the Union Government alone ? 10. The Government of India passed the “Recovery of Debts Due to Banks and Financial Institutions Act” in ______. 1. Who among the following acts as agent of Government of India in respect of her membership of IMF? 2. Index “Residex” is associated with______. 3. The ‘Dolex’ Indicator is related to which of the following Financial Markets ? 4. Industrial exit policy means _____. A. Forcing foreign companies to leave India. B. Forcing business units to move out of congested localities. C. Allowing manufactures to shift their line products. D. Allowing business units to close down. 5. All commercial banks demand deposit liabilities may decrease as a result of _____. D. The chasing of a cheque by an individual or a firm. 6. Which of the following is not a component of foreign aid of a country ? 7. Which of the following represents priority sector lending by commercial banks in India ? (A) Lending to heavy industries. (B) Lending to foreign companies. (C) Lending to agriculture, small scale industries and the weaker sections of the society. 8. In the post-liberalization period, the share of direct taxes in gross tax revenue in India has ________. 9. If the government chooses to spend money freshly printed by the RBI against government securities,it should be kept in which among the following ? 10. Which of the following defines letter of credit ? A. A contractual agreement made between different parties to compensate for any damages or losses. B. It is a letter from a bank, guaranteeing that a buyer’s payment to a seller will be received on time and for the correct amount. C. A solemn promise or agreement to do or refrain from doing something. D. A security interest on real property grant to a lender. 1. 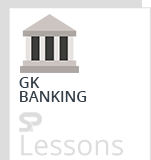 Which of the following term is related to Banking/ Finance ? 2. The Global Hunger Index is compiled by the ……………. 3. Which of the following is shown on Liabilities side of a bank’s balance sheet ? 7. How many food parks do the government aims to set up across the country in 12th plan ? 9. Which amongst the following promoted the concept of self help groups (SHGs) for financing the poor ?